Coronal Mass Ejections (CMEs) are one type of interplanetary structure that mostly affect the geomagnetic field (e.g. Gonzalez and Tsurutani, 1987; Zhang et al, 2007). These structures are observed and studied through coronagraphic images. The basic limitation of the coronagraph is that it shows the corona only in the plane of the sky, and blocks by necessity the view on the solar disk. Thus, the projection effect in the kinematic properties of a CME increases as the propagation direction of the CME approaches the line-of-sight of the spacecraft. So, the measurements of the propagation speed in this case are not accessible to coronagraphic observations, only the expansion speed. We explore if microwave emission can be used as an alternative for coronagraphic proxies for CME propagation speed. Also, we use the microwave proxy, together with the empirical interplanetary acceleration model devised by Gopalswamy et al. (2001), to predict the CME arrival time at Earth of 11 Earth-directed CMEs. We carefully select a data set of CMEs observed at the limb by LASCO coronagraph on board the SoHO spacecraft to reduce the projection effect. We assume that the measured projected speed is the outward CME propagation speed. Also, we identify the associated microwave burst from the microwave data provided by the US Air Force Radio Solar Telescope Network (RSTN) and calculate the respective fluence at 9 GHz produced by gyrosynchrotron emission. Figure 1. 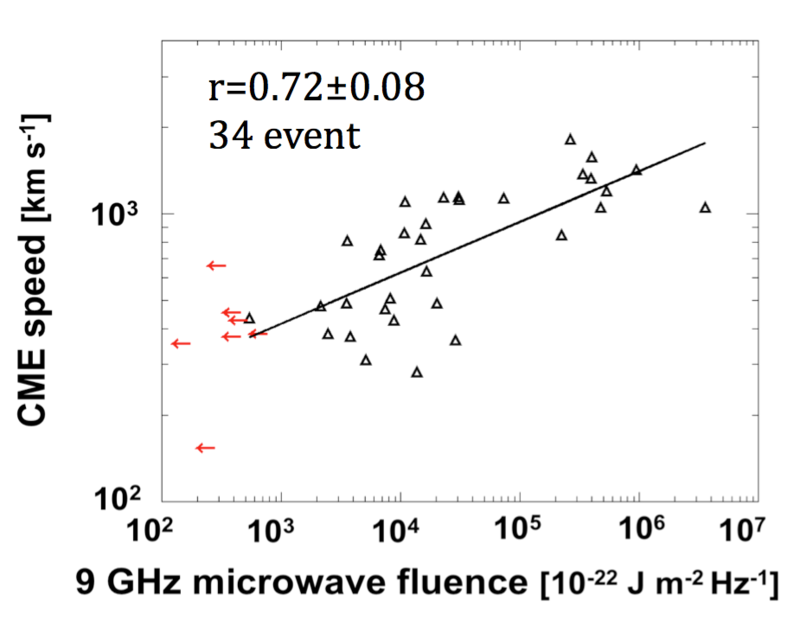 Scatter plot for limb-CME speed during the period 1998-2014 versus the microwave fluence at 9 GHz. The red arrows represent the upper limits. This relationship is used to infer VCME of Earth-directed CMEs from the 9 GHz fluence of the associated microwave burst well observed on the solar disk. Since CMEs undergo acceleration/deceleration during their travel in interplanetary space, we apply the estimated propagation speeds in the empirical propagation model by Gopalswamy et al. (2001) to predict the arrival times and speeds of CMEs at 1 AU. Figure 2. Travel time errors (predicted-observed arrival times) ordered by increasing longitude. The red lines mark the ±12 hr window and the black vertical lines mark the interval between the shock and the ICME arrivals. We compare predictions using different proxies and the results are plotted in Figure 2. Even though the sample is small, it is carefully characterized. The results in Figure 2 reveal that, on average, (1) microwave proxy performs better than the coronagraphic expansion speed and (2) the CME arrival time is predicted too early by using microwave fluence. A detailed analysis shows that the arrival time predictions of the ICMEs which are intercepted near the nose (N in Figure 2) range between 12 hours before and one hour after the arrival of the magnetic obstacle while the errors increase when the spacecraft intercepts the ICME flanks (F in Figure 2). This supports the expectation that the CME arrival depends also on where the spacecraft encounters the ICME. 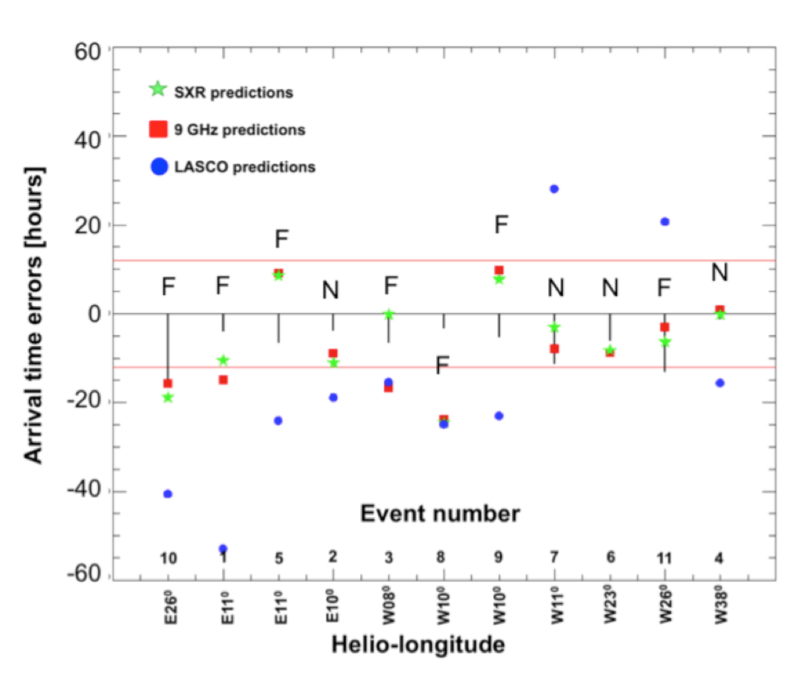 The success rate of the relationship found in this work in ICME arrival predictions was found to be higher compared with coronagraphic measurements by LASCO. Also, the accuracy was comparable to the results from more sophisticated tools of ICME arrival prediction. So, even though many sophisticated numerical and analytical techniques have been developed to forecast ICME arrivals based on coronagraphic observations, the non-thermal flare-related microwave emission is a valuable contribution and can provide very early warning. Because the radio observations exploited in this work are carried out from ground with rather simple patrol instruments, they have additional advantage of being less vulnerable to space weather hazards than space assets.